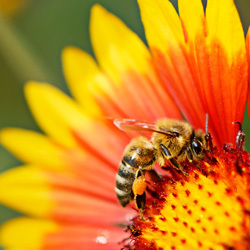 Urge the EPA to outlaw neonicotinoid pesticides that are killing off honey bees. It's long been known that Earth's honey bee population is decreasing at an alarming rate. The fact is, much of our natural ecosystem depends on the processes involved with bee pollination, and if this pollination cannot happen, many of our crops — from broccoli to strawberries — will be in grave peril. In fact, honey bee deaths are reaching a critical point, whereby it may not be possible to reverse the damage. The good news is that much of the population decline can be attributed to reversible human actions, including the use of neonicotinoids, insecticides chemically related to nicotine that cause honeybees, bumblebees, and beneficial ladybugs to literally drop dead. 06/14/2013: While the EPA continues to stall, new research suggests neonicotinoid pesticides may be harming more than just honey bees. According to the study, 90% of the active ingredients seep into the soil and groundwater, where they persist for as long as ten years. Additionally, the treated seeds are lethal to grain-eating birds, such as the partridge. The mounting evidence demands a moratorium on these pesticides until we better understand the long-term effects. 05/09/13: An annual survey of managed bee colonies in the United States paints a dire picture — nearly a third (31.1%) of bee colonies did not survive the winter. Last winter marked the seventh consecutive year when colony deaths exceeded the 14% threshold considered "acceptable" for over-winter loss. The EPA, meanwhile, continues to stall action against the pesticides contributing to this decline. If we don't act now to save Earth's honey bee population, we could reach a critical point of no return. You see, the planet's honey bees have been in steady decline for several years now — climate change, parasites, habitat loss are all contributors. Some of these issues are going to be difficult to tackle, but there's one catalyst that humans can act on right now. Bees are dying in large numbers as a result of the use of certain neonicotinoids to treat our crops over the past decade. Previously thought to be non-toxic to these precious pollinators, more recent peer-reviewed studies have linked the proliferation of neonicotinoids to a decrease in queen production and an increase in "disappeared" bees, the ones that never return to the hive from their foraging trips. While insect pests are detrimental to our crops, the loss of our honey bees would be catastrophic. We can handle some less-than-ideal produce. But we can't handle a total decimation of our food supply as a result of lack of bee pollination. You have the power to save our nation's food supply. Don't let this opportunity slip away: outlaw the use of the neonicotinoids killing our honey bees. On 6/20/2014, President Obama initiated a nationwide "Pollinator Health Task Force" that is dedicated to combating the severe losses sustained by honey bees and other major pollinators. In a Presidential Memorandum released by the Office of the Press Secretary, the President calls on the EPA to reassess the use of dangerous pesticides with a focus on their affect on pollinators. Tell the EPA to take this presidential mandate seriously and ban the use of deadly pesticides! That's 43,530 signatures! Let's keep the ball rolling.